The real interest rate is the nominal interest rate – inflation rate. A higher real interest rate is good for savers and bad for borrowers. 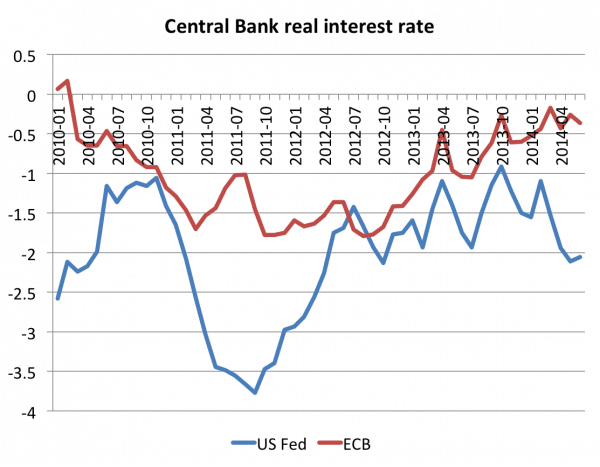 Real interest rates can be negative if inflation is higher than nominal interest rates. If inflation is 7%, this may sound very bad for savers. It means the value of money is declining by 7% a year. However, if interest rates are 9%, then savers can still protect their saving. This is because the interest on their savings outweighs the decline in the value of money. 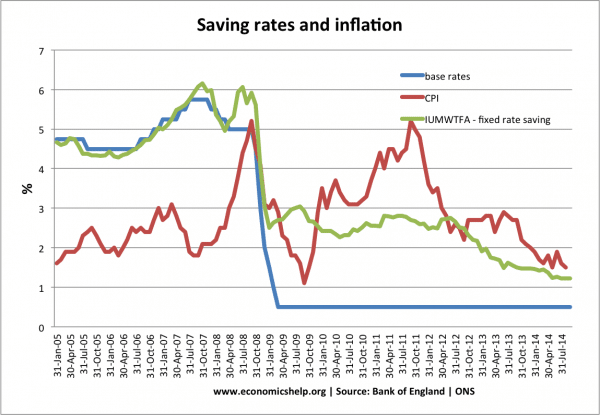 If inflation was 7%, but savers only got 4% interest, then savers would lose out. Note, the actual saving rates that banks pay. 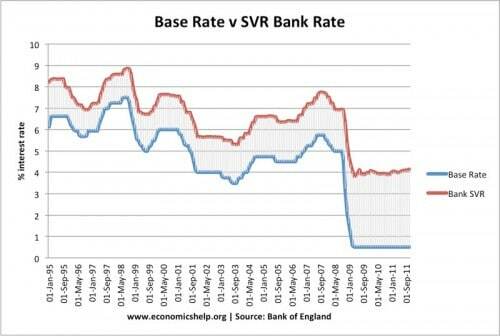 Don’t always mirror Bank of England base rates. In the credit crunch, banks were slow to cut interest rates. They needed to attract deposits. Therefore, real interest rates were better for savers than indicated by looking at base rates. In a liquidity trap, lower interest rates may be ineffective in boosting demand because there are many other factors at work. Commercial banks not wanting to lend because of the credit crunch. Fall in house prices due to lack of mortgage availability. This reflects the scale of the recession and how loose monetary policy has been insufficient to prevent the rapid decline in output and fall in inflation. Also, there is always an issue of time lag. It can take 18 months for interest rate cuts to have an effect. Another issue is that commercial banks may not pass base rate cuts onto consumers. 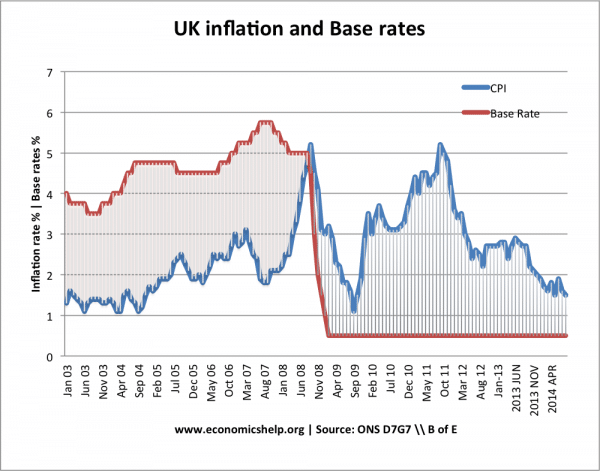 Therefore, the effective real interest rate may be different to the actual real interest rate, using Bank of England base rate. For example, although base rates in 2010 were 0.5%, banks may offer savers a rate of 4%. This is because banks needed to attract saving and deposits. 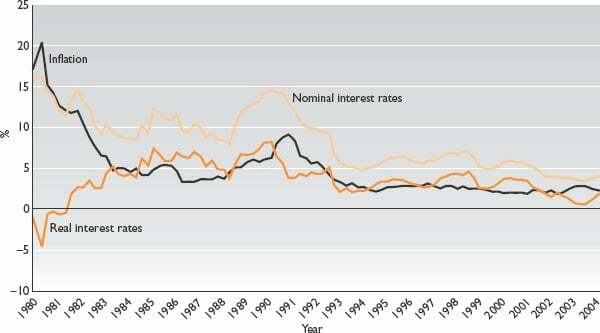 This shows that real interest rates in the EU were higher than the US and UK during the great recession. This is because Eurozone inflation was lower. 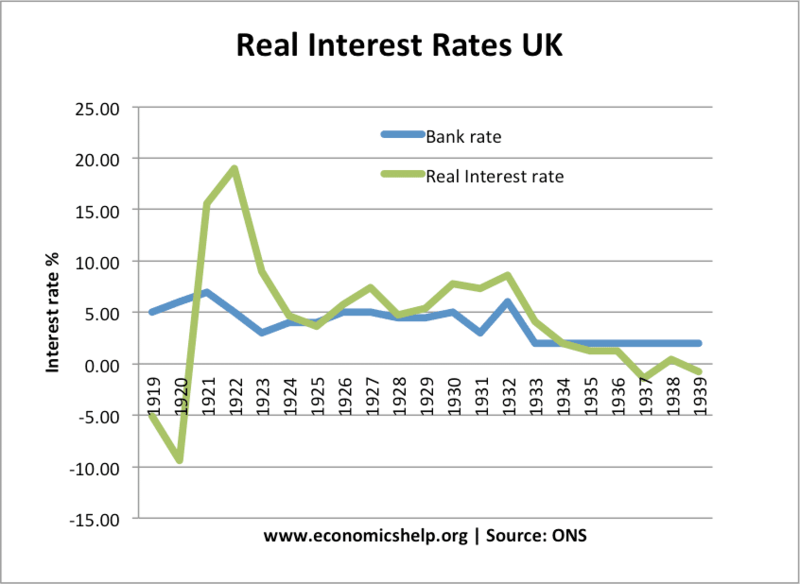 In the 1920s and 30s, real interest rates were very high. This was partly due to efforts to stay in Gold Standard and keep the Pound artificially high. The high real interest rates led to a period of deflation, high unemployment and low economic growth. This shows that in normal economic conditions, real interest rates tend to be positive. The credit crunch years were quite unusual. This entry was posted in interest-rates. Bookmark the permalink.